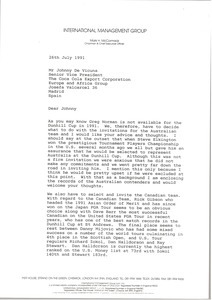 Informing Connery that Greg Norman is not available for the Dunhill Cup, and therefore they need to decide what to do with the invitations for the Australian Team and would like his advice and thoughts. Informing De Vicuna that Greg Norman is not available for the Dunhill Cup, and therefore they need to decide what to do with the invitations for the Australian Team and would like his advice and thoughts. 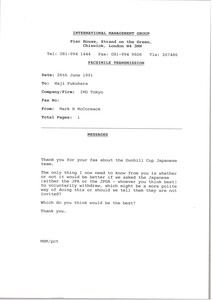 Discussing the Dunhill Cup Japanese team. McCormack was informed that Jumbo Ozaki has an injured shoulder and doesn't like cold weather, so cannot play and Tommy Nakajima, who won the tournament last year, doesn't think his swing is ready and also doesn't like playing in cold weather. Presents idea for joint project involving John Daly. 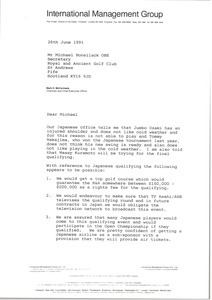 Sky would own British television rights to the long drive competition. More ideas for a John Daly Challenge from Bill Sinrich, and a production budget, are attached. 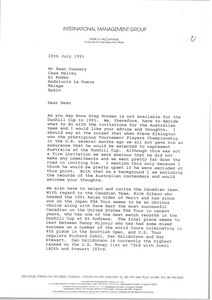 Ireland - Points to item in British press that tells how frustrated Motorola is that golfers are choosing an Irish tournament with appearance fees over the Western Open in Chicago, which is banned from paying appearance money. McCormack tells Brashear, of Motorola, that IMG could help in these situations. Argentina - Urges getting representatives from the Argentine Golf Association together with Colin Maclaine, saying, "this is where we can make some real money."